HTC U12 Plus VS OnePlus 6: which one should you buy? 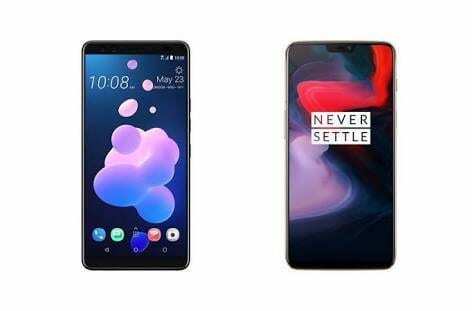 Home Comparison HTC U12 Plus VS OnePlus 6: which one should you buy? HTC U12 Plus VS OnePlus 6: which one should you buy? The latest flagship from HTC and OnePlus are among the best premium smartphones in the market right now. And they come at a rather cheaper price than flagship from Samsung and Apple. If you’re on a lookout for affordable smartphones with premium specs, then the HTC U12 Plus and OnePlus 6 should be on your radar. The OnePlus 6 is loved by many as they term it, “the flagship killer”. I think the days of Samsung and Apple killing us with expensive devices are long gone. Numerous OEM companies are now bringing smartphones with good value for me. Most people will only have a budget for one premium smartphone. So if you’re a HTC and OnePlus fan or you’re contemplating on buying their premium smartphone. Then this article is meant for you. Below is a detailed comparison between the 2018 premium smartphones; the HTC U12 Plus and the OnePlus 6. We’ve probably seen it all in 2018 in terms of design yet it’s never enough. The highlight of the OnePlus 6 in design is the new rear glass feature. Remember its predecessor, the OnePlus 5T features an aluminum back. Not only those the OnePlus 6 feature a rear glass but the glass has a mirror-like reflective surface. The HTC U12 Plus isn’t left behind as it also features a front and back glass with aluminum frame. The HTC U12 Plus is dust/waterproof with an IP68 certified rating. While there’s no such certification on the OnePlus 6. The OnePlus 6 looks sleek with 7.8 mm in thickness and weighing 177 grams. While the HTC U12 Plus is somewhat bulky with 8.7 mm thick and weighs 188 grams. At the back of both smartphones is their company’s brand name, fingerprint sensor, LED flash and dual rear camera. Their dual rear camera is aligned at the top center. The camera is in a vertical direction on the OnePlus 6 and a horizontal direction on the HTC U12 Plus. The OnePlus 6 is sold in Midnight Black, Mirror Black, and Silk White body colors option. While the HTC U12 Plus is sold in Translucent Blue, Ceramic Black, and Flame Red body colors. The HTC U12 Plus sports a 6.0 inch Super LCD6 panel with an 80.3 screen-to-body ratio. Most flagships of 2018 feature the better OLED screen technology. And am surprised HTC didn’t, which is probably one of the cons of the phone. Meanwhile, the OnePlus 6 packs a 6.28 Optic AMOLED panel with an 83.8 screen-to-body ratio. The display on the HTC U12 Plus features an 18:9 aspect ratio, 1440 x 2880 pixels resolution and 537 pixels per inch density. While the display on the OnePlus 6 features a 19:9 aspect ratio, 1080 x 2280 pixels resolution and 402 pixels per inch density. Despite the HTC U12 Plus featuring a better pixels resolution, it’s still no match to the OnePlus 6. The AMOLED panel on the OnePlus 6 will give it black and vibrant display. The camera of the HTC U12 Plus is one of the best things to happen to it. The smartphone is ranked #2 in DxOMark camera standing, only behind the legendary Huawei P20 Pro. DxOMark didn’t try out the camera the camera of the OnePlus 6, but it should make their top ten of they do. The OnePlus 6 features a 16MP primary sensor and 20MP secondary sensor. Both camera sensors has a f/1.7 aperture. While the HTC U12 Plus sports a 12MP primary sensor with f/1.8 aperture and 16MP secondary sensor with f/2.6 aperture. Moving to the selfie camera, the HTC U12 Plus sports an 8MP shooter with f/2.0 aperture. While the OnePlus 6 packs a 16MP shooter with f/2.0 aperture. Underneath both the OnePlus 6 and HTC U12 Plus is Qualcomm Snapdragon 845 chipset. With an Octa-core processor clocked at 2.8GHz and Adreno 630 graphics processing unit. This hardware is the best from Snapdragon so far on Android device. The HTC U12 Plus runs on HTC Sense UI skin, which is overlaid on Android 8.0 Oreo with 6GB memory and 64/128GB storage. While the OnePlus 6 runs on Android 8.1 Oreo with Oxygen OS 5.1.8 skin on top. The OnePlus 6 comes in two memory options; the 6GB memory with 64GB storage and the 8GB memory with 128/256GB storage. There’s nothing significant to separate both phones here. The HTC U12 Plus comes with a non-removable Li-lon 3500 mAh battery. While you get a non-removable Li-Po 3300 mAh battery for the OnePlus 6. They both support very fast battery charging technology. The OnePlus 6 is currently available for around $613 (N214,550). While the HTC U12 Plus is sold at about $881 (N308,350). Honestly, I don’t see why the HTC U12 Plus is over $200 (N70,000) more expensive than the OnePlus 6. Value for money is on the OnePlus 6.